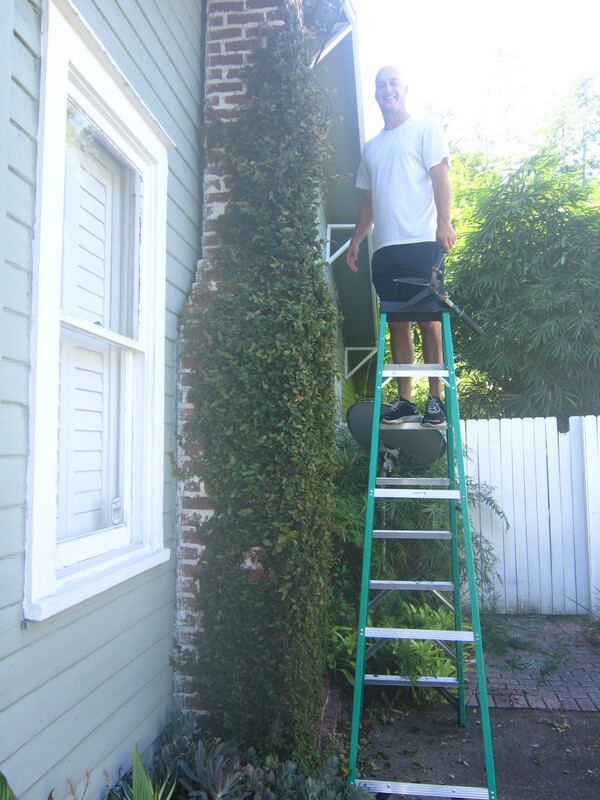 Every 4 or 5 months, whether we like it or not, at our house it is time to spend an hour or so on a Saturday morning trimming the creeping fig along the side of our house. Creeping fig, aka Creeping ficus, or Ficus pumilla, is a creeping vine that crawls along structures or walls and is a favorite Florida plant for disguising or softening fences or buildings. It needs no support and will send out little “sucker” roots to hold on to just about anything. 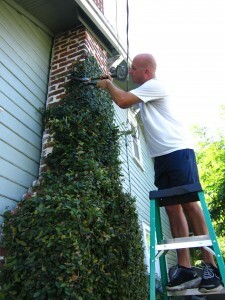 Read on to learn more about how to trim creeping fig to keep it looking great (and controlled!). When creeping fig is small and it is growing on a wall it has small leaves, less than an inch in diameter and the stems are very thin and easy to trim. As the vines age, or as they start to stretch out, the leaves get larger and the stem gets thicker. The branch can reach several inches in diameter and will actually set a “fig” type of fruit. This isn’t edible but it is a sign that your ficus is growing out of control! We’ve made the executive decision to keep our creeping ficus just to the height we can comfortably reach from the top rung of the ladder. When we wait too long to trim we have to delicately pull these new runners down and try to reign things back in. We also keep it several inches from the siding of the house because once these new shoots attach to the paint there is no way to get them off without damaging the siding. So, as I mentioned earlier, every four or five months Mike takes on this task. It is one of the few yard things that is “his” to maintain and he is so good at it that I don’t see this arrangement ending anytime soon! The tools required for this are simply a steady ladder and a pair of hedge shears. Because we have our creeping ficus fairly well trained we do not have to cut any large stems anymore but only the runners that are going out of bounds. If you inherit some out of control creeping fig you may need to use pruners or even loppers to get rid of the large stems so that the new growth is nice and tight to your wall or structure. The new growth is what you want for a tidy look: it is tight to the wall or fence while the older growth gives a more “shaggy” look and sticks out quite a bit. The difference is quick to see. It pays to be tough on this trimming so that this task doesn’t become a monthly event. Remember, this vine is pretty much indestructible so don’t be shy when you are pruning! Clip vines as close as you can to the base so that they don’t shoot out and it will also encourage new growth to stay tight to the wall. The results are immediately pleasing and well worth the hour or so that it requires. Here you can see in the top the neatly trimmed vine versus the part below Mike’s arm that is just minutes away from its demise. The runners going toward the siding are pulled off and cut and the new shoots growing outward are easily trimmed with the hedge shears. Ta-da! I have a shady spot in my front yard where grass can’t grow well. thinking about putting ficus pumila there but I’m wondering whether it can be mowed. I don’t think I’ve ever seen Ficus pumilla mowed. I think you would have better success with Asiatic jasmine instead. The ficus really wants to climb, so if it gets on trees or a fence it will take over- this is probably why it is rarely used as a ground cover plant. My grandmother has an abeloutsly massive one in her kitchen since the 80 s. Like this thing is curled under the ceiling its so big. They are SUPER super trendy. Like the only blog approved house plant, I would say. I have a zizi plant, also super hearty and sculptural, but its not a tree. Folks around here use Kurapia as ground cover (we have it in a small area in the front of our house). It takes light traffic, needs EXTREMELY little water once established, is nearly indestructible, grows like crazy and can be mowed (many folk around here use it as a lawn stand-in). I have creeping ficus and last summer it became very dry while we were on vacation. I cut all dry branches back and removed all the dead leaves. I have been watering regularly but I’m not sure it will come back. It has been 4 mons. now and I am wondering if maybe I didn’t cut it back far enough. What are your thoughts? I would check to see if your plant is alive or not by scraping the stem with your fingernail. If you find healthy green or white tissue underneath then you just need to continue watering and wait, if however, you find there is just dead wood underneath it might be time to do more pruning. I would prune back small pieces until you get to a point where there is live tissue. If you don’t find any it may be time to look for a new plant. I have one and I have to say it’s pretty high mtianenance! Leaves started dropping so we watered it less; then moved it to sun; then to shade; then watered it a bit more .and now it’s an ugly site.Given how expensive they are I know feel the pain as there are only 8 leaves (and now calculate that each leaf is worth $50). So sad! And they grow fast, if they get too big, you have to make new babies and then they stay nice. Actually like the money-chinese money plant!!!! Is it possible to put something on the tips to keep them from growing? This might sound crazy, but what about glue? Or maybe burning the tips? I really like how my creeping fig looks now, and I don’t want it to grow anymore. Any ideas are appreciated. I am afraid there isn’t such a solution. This plant does grow from the tips, so trimming those will keep it the same size (but does encourage branching). There are “growth regulators” available to the commercial landscape industry, but most of them do require an applicators license. Will these creeping plant grow on metal trellis..? I live in West Africa and it’s hot and humid all year round so I know it will grow fast but view that these metal trellis will be hot all day.. I wonder if they would climb it. I hope it doesn’t cos I only want it for the wall that is 150ft long and 5ft high. Metal trellis is on top. I know that it will climb your wall well and I have a feeling that the hot metal will discourage much growth on top. If needed, a trim 1-2 times per year would keep it off. Good luck! I had a beautiful 30 year old vine. About a month ago this healthy 100 foot vine went from lush green to brown curled leaves. My nursery said it had been poisoned. I still clings to the wall and I haven’t removed the brown leaves. I keep watering it and seems are still green when I tested. It has a new purple growth of about a quarter inch. We are still having110 degree in Phoenix so afraid to prune or remove dead leaves. Any and all suggestions would be appreciated. I have enjoyed the lush coverage on my house. I also trimmed regular prior to poisoning. Thank you. I am sorry to hear about your plant! Ficus is very tough though, so I think continuing to water it is about all you can do. Resist the urge to fertilize or add any other nutrients, as they really won’t help much without any leaves. My suspicion is that the new growth will start lower to the base of the vine rather than the ends. Give it some time. You may end up trimming the long runners back, but I would wait 3-4 months to look for any new growth. I live in coastal Charleston SC and have this covering my entire brick wall. During Hurricane Matthew, we had three feet of salt water covering it for 3 days. It is now 2 months later and it is all brown up to the water line. The top is still green. Does this mean it might have a chance of regrowth at the bottom? Any recommendations on what to do to help it along? Patricia- Yes, any green growth at the top is a good sign! I would go ahead and fertilize it next spring. As we go into the winter months I wouldn’t expect to see much happening, but once the weather warms water it liberally and fertilize to give it some extra help. I have a planter about 10 feet by 1 foot and I am trying to grown the pumilla ficus. Some of the branches are growing up intead of straight on the “ground”. Should I cut those flying branches in order to train them to become a ground cover? I would go ahead and try to “pin” those down to the soil to get more coverage. Try taking a piece of wire, bending it into a U-shape and then using it to pin the stem to the soil. Once it has good soil contact it will start growing roots to secure itself to the soil. I have 2 Ficus Pumilla Questions. 1. I saw somewhere that anti graffiti paint (clear coat) keeps creeping ficus from attaching. Now I can’t find the articles I read and can’t remember the active chemical. Have you heard of this? 2. Will a right angle of roofing sheet metal sticking 3″ out of wall above windows keep the ficus from growing down into them? Or will it just tumble over the “shelf” and attach via a breeze? I do the active maintenance like your husband! Oh no, Joe! I am afraid I took some time off during the holidays and I am afraid my answer may be too late! – I have not heard of paint of any type stopping ficus from spreading. – I don’t think the sheet metal will do the trick to stop it. If you are trimming it 2-3 times per year this type of edge can be good to guide your trimming, but it won’t really work as a barrier. I’ve seen ours crawl over a concrete sidewalk, so very little discourages this plant! My fig ivy is now brown and appears dead after a freeze in Houston. Will is grown back? How long has it been growing? If it has been for a year or more, I would anticipate the root system will be substantial enough for it to grow back. If it is a new plant it is hard to say. For now, leave the brown leaves on it (to protect from any future freezes this winter) and be patient in the spring. My creeping fig is about 10 feet tall. the leaves are all brown and curled. Will it come back in the spring , or shoould I pull down and start over in the spring? Try using your fingernail to scratch one of the larger stems. If you see some green, go ahead and leave it. If you only find dead tissue I would cut to the ground and let it grow back from the roots this spring. Hi! I’m so glad I stumbled across this page. We bought a house that is covered in creeping fig. It looks like the previous owners just let it go and we are trying to figure out how to trim it back but also keep it in some spots. It’s all along the side of the house, wrapping around trees, the back of the house and porch have it and also the front. I like it in some spots but not all and I’m at such a loss! Would love to send some pics for advice?? When I moved into my house it had grown over the sides and into the windows. When I removed it, it actually pulled off the paint! My suggestion to you is to remove it from the sides of the house and keep it on only your fence. If you really like it on the side panels of your door, try to keep it to a confined rectangle so that it doesn’t go to crazy. It does look pretty, so decide how tall you can reach on a step stool and make that the “limit” for trimming. We trim ours 2-3 times per year, so it isn’t too much work if you like the look. I would take it off of the tree too. The easiest way would be to just cut all of the stems around the trunk and let it die. If you don’t mind some brown leaves for a little bit it won’t hurt anything for it to die there. I have a rock wall that was covered in very established fig ivy. We had an unusually cold spell here this winter and it killed the existing leaves and stems. There is a ton of new growth, so I know they are coming back, but what do I do about the immense amount of dead foliage on top of it? Tear it down or leave it? I would probably try to clean out some of the brown leaves. You may be able to just pull them out, but don’t be afraid to trim the stems back too. It will quickly grown and fill back in! I recently bought a tiny creeping fig and planted it near a wooden post in my back yard. I used floral wire around the very tip to help train it to grow upwards but It is starting to look a little brown and leafless around the wire area.. could that be affecting its growth? Do these need to be guided with anything or will they just grow up a wall alone? It should grow on its own, but a little bit of wire or string to train it won’t hurt a thing! I would keep watering it regularly (especially during the dry season) and it should recover without any problems. I’m starting from scratch and really want to try a creeping fig for a section of my brick home by the front steps, basically on the front wall of my home. Can I start it out in a pot as I only have a side walk right there and no garden to plant anything? That will work, but I would suggest that you get the largest pot possible. 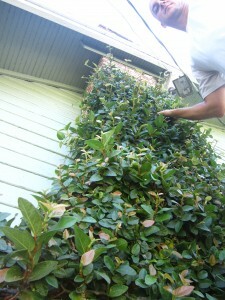 Creeping fig is very tough, but when it dries out to an extreme the leaves will turn crispy and fall off. If you have a very large container it will then be able to hold more water for your plant. Good luck! I’m trying to grow a creeping fig vine on an aluminum pergola. It’s growing well but not attaching to the post. I have it in a large container but the vines are growing away from post and I can’t think of how to keep it on the aluminum since I can’t drill to put hooks. Any ideas. I guess other than hot glue gun. Actually, a hot glue gun probably isn’t the worst idea! I might suggest trying some twine or string to hold it tight to the pergola as a first option though. The ficus will send out small root-like growths to anchor it down, but it needs to be in contact with the structure. If you do decide to hot glue, make sure you use a “cool” hot glue gun (think the cheap, dollar store kind of glue guns) and not a heavy duty gun where the glue is very, very hot. Let it cool slightly before pressing your stem into the glue. I live in sunny Southern California. I have a brick wall surrounding the back of my property and want to cover it in green. 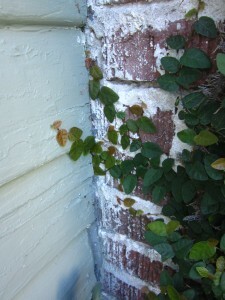 I’ve read very good things about the Creeping Fig but other things I’ve read make me hesitate about planting it. Is it wise to plant over all of my brick wall? Is that too much? I’ve seen it trimmed and don’t like the under branches once it is sheeted back so close to the wall but I do want the plant close to the wall. Any suggestions about pruning? How is the variate form compared to the green version? As you can see here, we have it planted over a brick chimney. I should mention that we don’t use the chimney though! I do think it is a plant that needs to be trimmed occasionally to keep it tight against your wall, so know that this regular maintenance will be part of the deal. If it is trimmed regularly you won’t see the thick branches too much. We use hedge shears for this, but if you had a high quality electric hedge trimmer I think that would work too. The variegated is pretty but not nearly as aggressive as the all green variety so I don’t think it will grow adequately for this purpose. Good luck! Thank you for the awesome writing. I have shared it on my social media accounts. or something like that, that it could not attach itself to so we could get it to grow in just a specific area…silly?? Unfortunately, no, there is not a way to control where it grows other than regular trimming. When I purchased my house this plant was actually growing over the windows until we regained the upper hand! I will tell you that trimming 2-3 times per year is usually sufficient to maintain the plant where you want it. Keep this in mind so that you don’t let it grow in a place that is very hard to get to or inaccessible on a ladder safely. I have a large section of the front of our home that has the creeping fig. We enjoy the look, but after the cold winter we had here in Texas, much of the top has not come back green. There is a lot of brown with just a few green shoots mingled in. Should I prune it back to the green? I don’t want to kill it. At this point I think it would be best to trim it back to the green. With plenty of heat and rain it will quickly recover again and probably look better than leaving the empty brown stems. We also live in Charleston SC where the weather is hot and humid much of the year. Our garage, front steps and side connectors are brick and the ten foot high foundation wall is stucco. Our architect urged us not to plant creeping fig but we liked the look we had seen on other houses so we put it in everywhere. Big mistake. It grows while you look at it. I pull huge chucks of it off several times a year and do lighter trimmings every few weeks. The more it is pruned the more vines it produces. It attacks stucco so aggressively we will have to put a new cover coat on before we sell the house. Also any wood surface will have to be sanded before it can be painted. If it gets under wood trim it can force the wood apart. 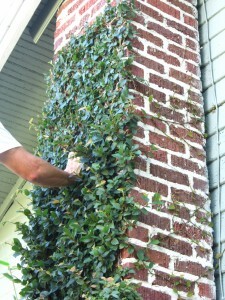 It looks great on all the brick right after it has been trimmed but gets out of control very quickly. It has also moved aggressively into the foundation plantings-jasmine, holly, boxwood, etc. If your climate is like ours be sure you are willing to do the work-unless you have a professional landscape service that will keep it trimmed. It looks great much of the time but is a constant battle and can be destructive if you turn your back. Make sure the base will be easily reached if you plant it.